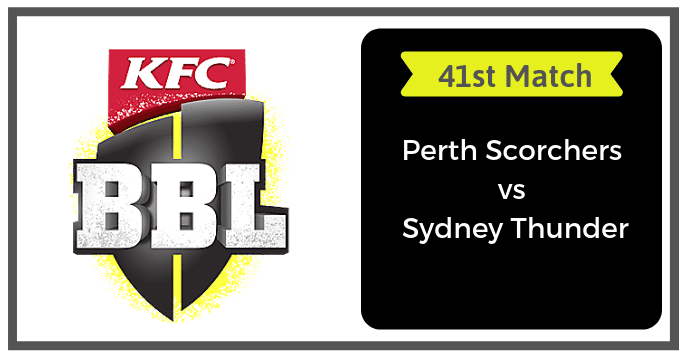 Today Match Prediction of Perth Scorchers vs Sydney Thunder, 41st Match Match Preview, Playing 11, Injury updates, News and Dream11 Prediction. If you are looking for PS vs SDT Dream11 Prediction then you are are the right place. Perth Scorchers is all set to take on the Sydney Thunder on Thursday, January 24, 2019, at Perth Stadium, Perth. If you want to know who will win then you are in the right place. In Today’s Dream11 Fantasy Cricket Match of SDS vs HBH, we will cover Pitch Report of Perth Stadium, Perth, Predicted Playing 11, Toss Prediction, and Fantasy Cricket News and Tips. Who Will Win Today Between PS vs SDT 41st Match? A crucial match for both the teams as the winning team will surely jump in the points table. Perth Scorchers and Sydney Thunder will definitely want to win today’s match as they will not do any good to their team if they lose the match. Perth Scorchers has played 9 matches, won 3 and lost 6 matches. They are at the bottom of the points table with 6 points in the pocket. After winning two matches back to back they have lost their last match against Hobart Hurricanes. Ashton Turner, Cameron Bancroft, Hilton Cartwright and Michael Klinger are the top scorers of PRS team. They have scored 302, 191, 129 and 115 run so far in the Big Bash League 2018-19. Andrew Tye, Nathan Coulter-Nile and Jason Behrendorff are the top wicket-takers. They have taken 12, 9 and 8 wickets. On the other hand, Sydney Thunder has played 10 games, won 4, lost 5 and one game was a tie. They are in the fifth position of the points table with 9 points in their wallet. The Thunders have witnessed a mixed result in this tournament. They have lost their last match against Melbourne Renegades. Shane Watson, Callum Ferguson, Jason Sangha and Daniel Sams are the top scorers of SYT team. They have scored 289, 228, 171 and 155 runs respectively. Daniel Sams, Fawad Ahmed and Gurinder Sandhu are the top wicket-takers. They have taken 14, 11 and 7 wickets. Mitch Marsh, Shaun Marsh, Ashton Turner, Cameron Bancroft, Hilton Cartwright, Andrew Tye, Nathan Coulter-Nile, Jason Behrendorff and Michael Klinger are the key players of Perth Scorchers Team. The PRS team management has announced 13-players squad. They have made four changes in their squad. Jason Behrendorff, Shaun Marsh and Mitch Marsh have been included in the squad. Fast bowlers Liam Guthrie has also joined the squad. Sam Whiteman has been dropped because of injury. David Willey has left for the UK because of the left shoulder injury. Aaron Hardie is also dropped from the squad because of injury. Will Bosisto has been dropped from the squad. Batsmen: Ashton Turner, Shaun Marsh, Hilton Cartwright, Michael Klinger. Bowlers: Nathan Coulter-Nile, Jason Behrendorff, Andrew Tye, Usman Qadir, Liam Guthrie. (C), Cameron Bancroft, Liam Guthrie, Nick Hobson, Ashton Turner (VC), Nathan Coulter-Nile, Jason Behrendorff, Shaun Marsh, Hilton Cartwright, Usman Qadir, Matt Kelly, Andrew Tye, Michael Klinger. Shane Watson, Anton Devcich, Callum Ferguson, Fawad Ahmed, Gurinder Sandhu, Jason Sangha and Daniel Sams are the top players of Sydney Thunder Team. Shane Watson will lead the SDT team. The SYT Team management has announced 13-players squad. They have made three changes in their squad. Jay Lenton has been ruled out of BBL because of injury. Matt Gilkes and 19-year old Baxter Holt have been included in the squad. Holt has replaced Kurtis Patterson. Nathan McAndrew has been included in the squad while Arjun Nair and Jono Cook has been dropped from the squad. Shane Watson, Anton Devcich and Callum Ferguson will lead the batting department. Fawad Ahmed, Gurinder Sandhu and Daniel Sams will lead the bowling department. All-Rounders: Daniel Sams, Anton Devcich, Nathan McAndrew. Shane Watson (c), Fawad Ahmed, Matthew Gilkes, Baxter Holt, Nathan McAndrew, Daniel Sams, Jason Sangha, Anton Devcich, Callum Ferguson, Chris Green, Chris Jordan, Sam Rainbird, Gurinder Sandhu. Fantasy Cricket Pro Tips: The above players are most likely to perform today. You can take them as a captain and vice-captain. You can also take a captain from expected playing 11. When Sydney Thunder and Perth Scorchers faced each other last time. SYT has defeated PRS by 1 run. If we look at the statistics of the last five matches of PS vs ST, PS has won two matches whereas ST has won three games. If you go by crix11 astrology prediction, PS will win the match today. The team winning the toss should opt to bowl first as the team batting second has won all the four matches played on this ground this BBL. according to Crix11 astrology prediction, PS will win the toss and ask SDT to bat first. The match will be played on Thursday, January 24, 2019. Match Big Bash League 2018-19, PRS vs SYT, 41st Match. Time 10:40 AM GMT, 04:10 PM IST, 06:40 PM LOCAL. The Perth Stadium has always favoured the bowlers especially the seamers. The pitch will favour the fast bowlers in the initial couple of overs and as the game progresses the batsmen can take advantage of the wicket. Dream11 Fantasy Cricket Tips: Try to take middle-order batsmen and fast bowlers in your fantasy cricket teams. The weather of Perth is predicted to be cloudy in the morning followed by sun in the afternoon and evening. The sky will be clear and there is no sign of rain. The temperature is expected to be 20-Degree Celsius and the humidity to be 54%, which may go up to 77%. Fantasy Cricket Expert Tips: The weather condition may favour the fast bowlers’ especially in the first couple of overs. SDS vs HBH Dream11 Tip of the Match: Make a team where you select middle-order batsmen and fast bowlers. This is it for Today’s PS vs SDT Dream11 Fantasy Cricket Match Prediction of 41st Match. Read the complete post and win in any fantasy cricket league. Leave a comment below and share the post so that others can also find Crix11 which is the best fantasy cricket prediction site. Don’t forget all the information on this website is absolutely free and if you utilize the data correctly your winning chances is 100% sure.